So you have an artificial Christmas tree displayed in your house and you aren’t quite ready to put it away? Make it into a Valentine Tree! Deck that tree out with Valentine’s Day ornaments, lights and garlands and you won’t have to put it away quite yet. I had never thought of redecorating my tree but I am notorious for keeping my tree up way beyond the commonly accepted date in early January. One year it was still up for the Super Bowl! So, I was visiting a doctor’s office this week and discovered that they had redecorated their Christmas tree. It is now a Valentine tree! What a fun idea. I liked it so much, I took these pictures to show you. In looking around online for Valentine ornaments, lights and garlands, there is much to choose from. Of course, making heart shaped DIY ornaments is a wonderful option, too. Your kids will love it! *If you don’t like the tree skirts made for Valentine’s Day, get some fabric or a table cloth that strikes your fancy and just drape it around the base of the tree. While I was browsing around in search of decorations for an artificial fir tree, I discovered that there are some very classy ornament-hanging trees that you can get to place on a table for display, such as the one above made by Lenox. There is even a tree that comes with its own Valentine ornaments. Doesn’t get any easier than that! Do you decorate for Valentines’ Day? We’d love to know what you do! Yes, we had a shower. A bridal shower, to be exact. My dear granddaughter, Sara, was getting married. What fun it was to celebrate with her! This was the first really big event we held in our home since we renovated. The new dining-room and widened kitchen easily accommodates more guests and, since I was currently not employed, I had lots of time to put into hosting a nice party. The wedding was scheduled for March so we picked a February date for the shower and made it a Valentine’s Day theme. First on the agenda: invite guests. Sara and her mother gave me a list and I took it from there. Though plenty of bridal shower invitations are available in stores or online, I decided that I would rather make them myself. That way I could apply the money I saved by making the invitations on other parts of the event. The backside of the invitation included date, time, location, etc. It would have been nice to have super-software like Photoshop to design it, but that was not the case. 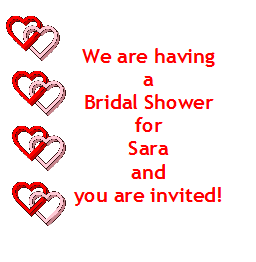 So, I designed the invitation using Microsoft Word and adjusted, adjusted, adjusted. 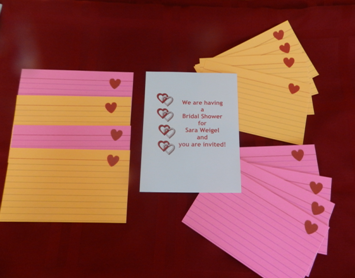 The greatest challenge I ran into was getting everything centered so that we could get four, two-sided invitations on a sheet of card stock Plus, I was using text blocks to hold the heart-shaped images. Getting them to stay in place was interesting …a battle that I won, I am happy to report. We asked the guests to bring their favorite recipe for Sara. I inserted blank cards in with the invitation for them to use. I bought pink and orange index cards for them to write on and decorated them with a glittery red heart sticker to make them look festive. Now, this is something you can purchase to make them even nicer. Amazon has a number of awesome recipe cards you will love. Front of invitation with recipe card inserts. Printing the invitations with a really crisp print was very important to me. Inkjet printers just don’t do that. So, I took the design on my flash-drive to Staples and had them print and cut them for me. They looked great! Have you ever hosted a bridal shower? Love to get your wisdom on it. Wondering what food to serve at your party? Our guests loved the Pretty Party Punch, Italian Tossed Salad wth field greens, two kinds of quiche and cake for dessert. Looking for some fun new ideas for your family [or classroom] to celebrate Valentine’s Day in style? Here are 15 fun crafts, recipes, party favors to make that will make Valentine’s Day memorable! 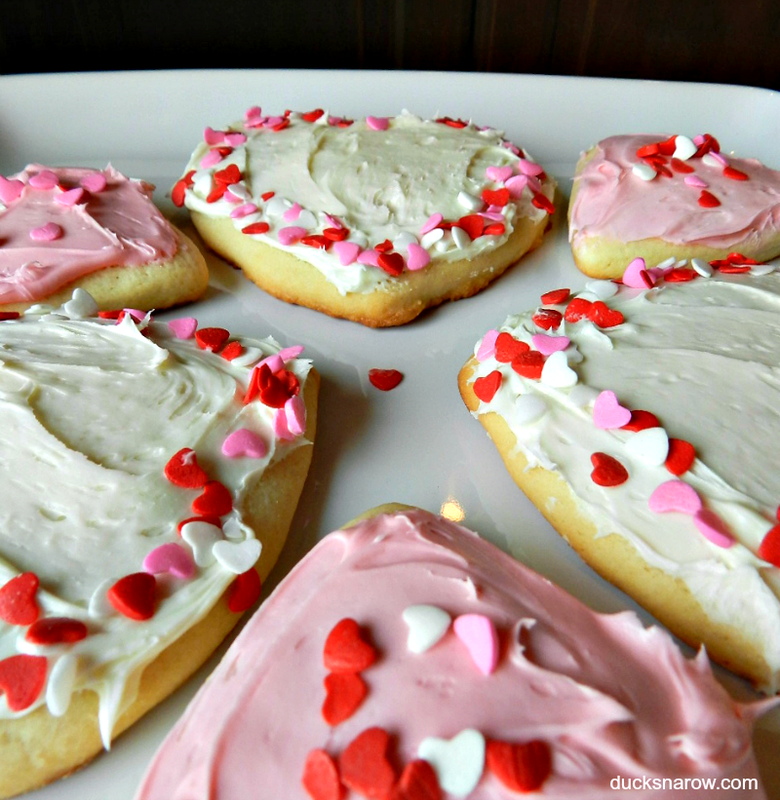 Do you have any fun family traditions or craft ideas for Valentine’s Day? We’d love to know what you do! I’m Susan, a lifestyle/food blogger from the most – – of every moment and I’m so excited to be writing for Ducks ’n a Row today! Two tiny hearts in miniature frames have been displayed in our home for many years. They are as valuable to me as any purchased masterpiece. Flowers and candy are traditionally associated with Valentine’s Day, but one year I received a precious gift from my daughter that was neither of these. Had she given me flowers, it is quite possible I would not still remember what color they were. Details about a box of candy would likely have been forgotten as well. But this small gift, made for me by my daughter in preschool, is something I will treasure forever. My daughter could hardly wait until we got home from preschool to proudly present me with her gift. It was a framed heart, made with paint and her tiny thumbprints. Although quite a lovely little piece, I immediately realized the real value of it was sentimental. I knew that one day I would look at it, and be reminded of her tiny hand in mine, and of how those little fingers would fondly stroke the ladybugs she loved to find. I knew that in the future I would feel regret if I did not have a similar keepsake made by her little brother. Using paint for this project seemed a little ambitious for my busy two-year old. With a stamp pad, we accomplished the craft and I was able to preserve his thumbprints in a heart-shaped pattern as well. Doing this only took a few moments, but they were moments wonderfully well-spent! The idea for this inexpensive, easily-made craft is not new, but I consider it an idea worth sharing. It could be just the perfect Valentine’s Day present for someone in your life. Teachers could help their young students make these as gifts for parents. Daddies could help kids surprise their mommy with one. Grandparents would love to get something like this from their small grandchildren. Press your thumb (or guide your child’s thumb) onto the stamp pad or paint until the pad (inside area of thumb from first knuckle to tip) is well covered in red. Carefully press the inked/painted portion of the thumb onto the middle of the white paper, rotated left to form one half of the heart. Repeat steps 2 and 3, but this time angling the thumb to the right, with the bottom of the pad overlapping the first oval to roughly form a heart shape. While paint or ink is drying, draw or trace a heart onto the pink paper. Be sure this heart is somewhat bigger than the one you imprinted on the white paper, and that there is enough of a pink boundary left around it to fill in the square viewing area of your frame. Carefully puncture the center of the pink heart with your scissor tip, then slide the scissor blade into the hole and cut out the heart shape without disturbing the rest of the paper. Create a picture frame mat for the red thumbprint heart, by centering the pink heart cut-out shape directly on top of it. Using the glass from the frame as a template, center the layered heart shapes in the middle of it, and then draw a square around the glass. Clean any smudges from the glass, and insert your artwork into the frame. Done! Be sure to write the date and the child’s name and age on the back of the frame! It could even be a sweet way to add a bit of sentiment to a more expensive gift for an adult, to tell “a special someone” just how much you care. Have you ever made a thumbprint picture before? Bio: Susan is a nurse, wife, and mother; her blog the most – – of every moment is about making the most of all life’s moments. Recipes, tips, inspiring stories and photos are posted at least four days a week: topics include entertaining, homemaking, family, pets, holidays, travel, and excerpts of life in Montana.